Rogers has finally launched its long-awaited suretap wallet product, available today for a number of devices, including the Galaxy S5. 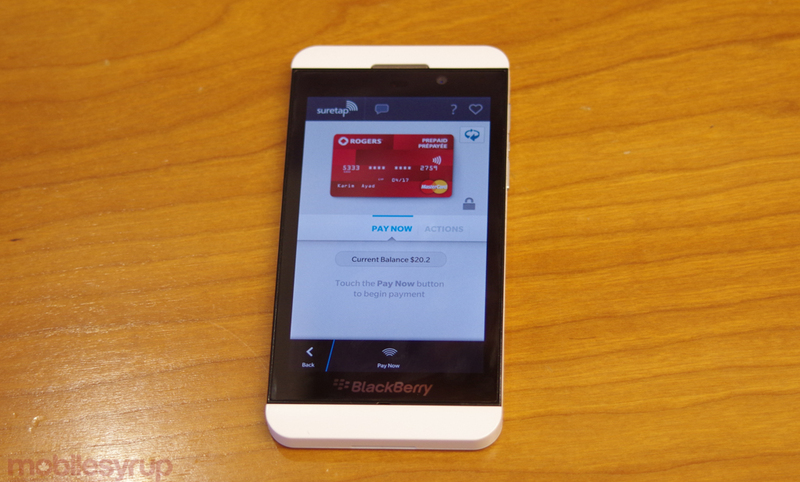 In fact, all future NFC-compatible Android and BlackBerry devices will arrive with suretap wallet pre-installed. So what is it? And why use it? That’s a good question, and one Rogers is trying very hard to thoughtfully answer. At its core, suretap wallet is an open destination for cards, all types of cards, from payment to loyalty to gift. At the moment, the selection is rather barren — there is no credit card support, and loyalty is nowhere to be seen — but Rogers promises that will get better very quickly. Using the combination of a secure element, in this case a SIM card designed to store payment credentials and pass them, securely, to a payment terminal for which only the issuer has the key, a user can treat a touchless retail terminal the same way they would a physical credit card. The payment itself is processed wirelessly using near-field communications (NFC), eliminating the need to enter a PIN code or issue a signature. According to Jeppe Dorff, the Vice President of Transaction Services at Rogers, the Canadian market is primed for such a change. Over 80% of Canadian point-of-sale terminals have been converted to support tap-to-pay, at which an individual would hold a credit card close to the receiver to process a payment. For security reasons, most issuing banks limit this transaction to between $50 and $100 per transaction — the convenience must have an ancillary tradeoff — and this is true of transactions made on the device as well. To ensure that Suretap wallet is somewhat functional out of the box, Rogers has worked with Peoples Trust Canada, a credit union that has a relationship with MasterCard, to provide a Rogers-branded virtual prepaid credit card to all users. Signup is quick and easy, since the per-transaction limit is $100. Initially, the card is considered “restricted,” which limits the maximum load to $200 and three “top-ups,” which can be made from any credit card. Customers who want to continue using the card after that time will need to register it at Rogers’ prepaid portal, which requires more user validation. Once the restrictions are lifted, though, the card can be used in perpetuity, and the limit blooms to $500. The fine print is a bit pernicious: card top-ups cost $2 each, and there’s a $2.50 monthly fee irrespective of use. To cancel the card, too, costs a hefty $10 (though your balance is refunded). These are standard fees associated with any prepaid credit card — you’d find the same terms with an off-the-shelf card from Shoppers Drug Mart, for instance — but they speak to the broader issue of availability with suretap. Dorff says he has been working with banks to get their cards on the system, but it’s not as easy as flipping a switch. Even CIBC, which piloted suretap mobile with Rogers, has not made its Visa cards available for the wallet experience. There are, as one would expect, “multiple layers of security” between the cardholder and bank to ensure that payments are processed without incident and according to regulations, and banks are taking their sweet time turning physical cards into virtual ones, even if the infrastructure is available. Suretap wallet also supports a number of gift cards from various retailers: Cara’s many brands, including Swiss Chalet, Milestones, Montana’s, Harvey’s and Kelsey’s, along with book retailer Indigo, Earls Restaurants, JOEY Restaurants, Ardene, and SpaFinder Wellness 365. Users can buy them within the wallet itself, or add existing cards from those vendors, with more on the way in the near future. As for availability, Rogers suretap wallet is compatible with the Samsung Galaxy S5, Galaxy S4, Galaxy S3, Note 3, Note II, HTC One, LG G2, and BlackBerry Z10, with other devices like the Q10 and Q5 already going through validation. Users will also need a new secure SIM card, which should come for free with any new device, but can be purchased separate from Rogers for $12.99. 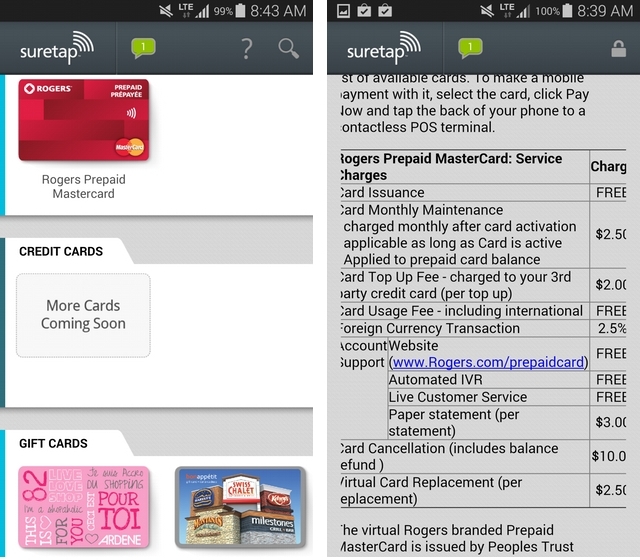 And unlike most existing Rogers apps on Android and BB10, suretap wallet is attractive, smooth and intuitive. It feels surprisingly modern. Though suretap wallet isn’t necessarily a game-changer, it’s a good first step towards solving the fragmentation problem in the mobile payment ecosystem.